Download our full report to read about the impact of our patient involvement. Today 2 in 4 people will survive their cancer, but at Cancer Research UK our vision is to increase survival rates so that 3 in 4 people survive their diagnosis by 2034. The experience and insight of people affected by cancer are vital in helping us to achieve this. Our impact report is packed with stories about the value people affected by cancer bring to Cancer Research UK. Discover how your support is making a difference by downloading it now. We reach out to the public to raise awareness of cancer, and funds for our work, by sharing personal cancer stories. These stories show the connection between our work and the reality of cancer. "Right Now" is our groundbreaking advertising campaign which aims to bring the real life experience of cancer patients in hospital to the fore. Adyan was one of the younger patients who featured in the campaign. People affected by cancer use their experience to help us spot gaps and develop solutions in the form of information and resources that will meet the needs of future patients and their families. The Sounding Board helped us shape our "Your Urgent Referral Explained" leaflet. This leaflet means that anyone who is referred for urgent diagnostic tests has access to helpful information while they're waiting for an appointment. People affected by cancer help us understand the realities of prevention, diagnosis, treatment and cure. This insight, combined with our policy research, cancer intelligence and statistics, informs our thinking in these areas. We support researchers to partner with patients from the early stages of their work. When we want to influence important initiatives, the patient voice increases the credibility of our recommendations. Our volunteer Campaign Ambassadors persuade politicians to make the political decisions that help beat cancer sooner. By speaking with their politicians, they bring a real life dimension to the big decisions that can make a difference to patients. Over the years, our Ambassadors have won us campaigns on tobacco control and sun-bed restrictions, as well as extra investment in early diagnosis. The Grand Challenge is an innovative funding scheme with an aim to identify the biggest questions in cancer research. Through consultation with the research community, patients and public, a collective of international, multidisciplinary teams put forward their proposals to tackle these key challenges. The winning teams receive an award up to £20 million over 5 years. This report shows the impact that the experiences of people affected by cancer have on our work. Their insight helps us make better informed decisions, and we want to ensure people affected by cancer are at the centre of everything we do. We have ambitious plans to increase patient involvement in our work. We will continue to consult people affected by cancer when we set our priorities and will work to embed patient involvement in all areas of our work where it can make a difference. The Network has over 800 members across the UK. It is open to anyone who has been affected by cancer and wants to use their experience to make a difference for patients. Our members get involved in a range of opportunities across the charity, from reviewing our information to helping decide what research we fund. 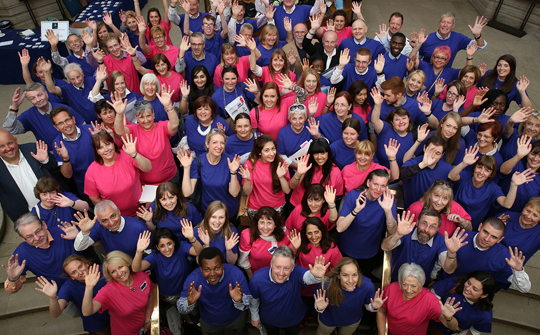 Our 400 Cancer Campaigns Ambassadors help persuade politicians to support cancer research, prevention, early diagnosis and treatments. Over the years, Ambassadors have won us campaigns on tobacco control, sunbed restrictions (to help beat skin cancer), and have secured extra investment in early diagnosis. Media Volunteers help people understand cancer better and raise awareness about our research and campaigns. They help us connect with the public and communicate the progress that we are making with our work. There are a number of ways to volunteer in this area, from public speaking and health promotion to taking part in TV, radio and newspaper interviews. Graydon is a new Involvement Network member. We spent the day with him whilst he participated in his first involvement activity. Find out how he got on.